Our Tattnall St. townhouse is a beautifully restored two bedroom structure offering the perfect combination of privacy, quiet luxury, and easy access to our beautiful historic city. Upstairs features two bedrooms, both with king size beds. Upstairs level has two full Baths along with generous closet space. There is a sleeper sofa in the living room. Complete with courtyard and off street parking, this well appointed townhouse is sure to please in this quiet neighborhood tucked away in the historic district. Rise with the Sun and go for a jog in Forsyth Park with the other early risers or relax in your own sunny courtyard with a hot cup of coffee. 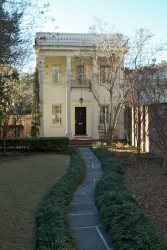 Stroll down Tattnall St. to Chatham Square surrounded by the history and charm of the surrounding antebellum neighborhood. Easy walking distance to City Market and River St. and all points of interest in the historic district as well as the Visitors Center just across Martin Luther King Blvd. Catch the water ferry to the Convention Center on Hutchinson Island or drive to the golden beaches of Tybee Island just fifteen minutes away. WiFi available. No smoking allowed. Please note that a longer nightly minimum may be required during peak season dates, holidays or special events. Additional fees such as taxes and cleaning will apply.